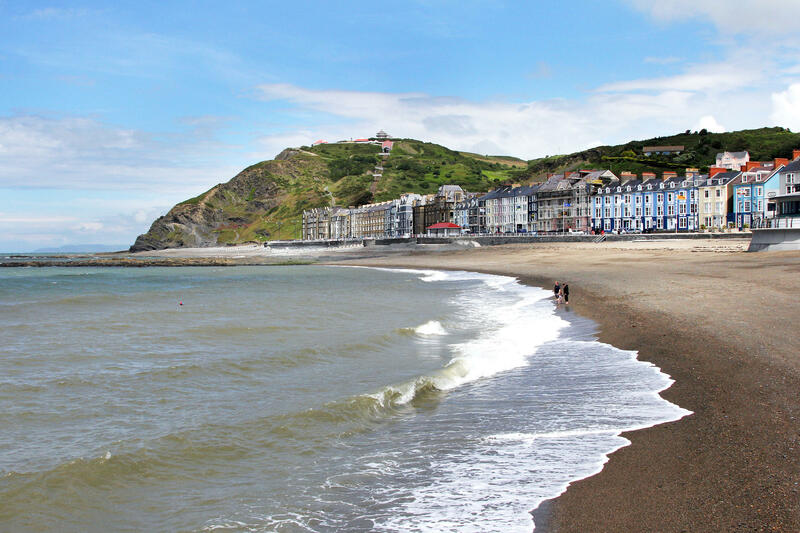 Aberystwyth lies in a cove along the Welsh coast and looks out toward Ireland. Aberystwyth is part of an area that YouGov, the on-line polling company, says is the most EU-friendly region in the United Kingdom. 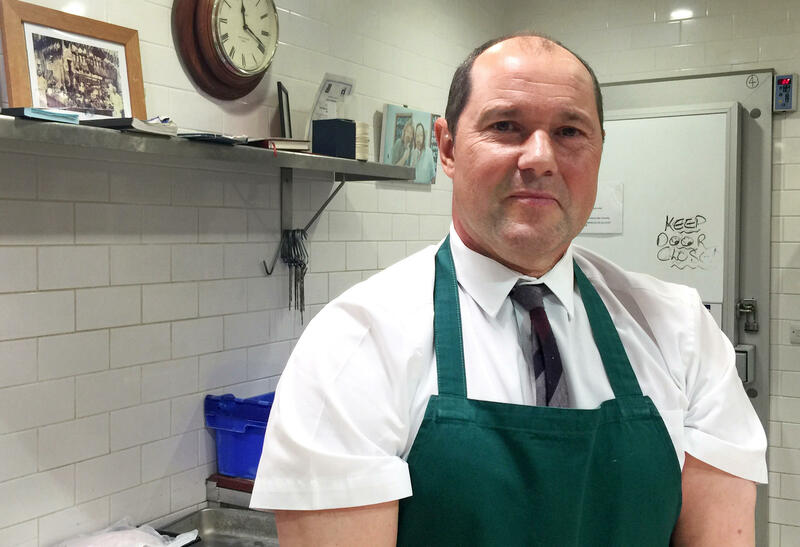 Tony Thompson, a butcher from Romford, hopes that the United Kingdom votes on Thursday to leave the European Union because he believes increased immigration has harmed his business. United Kingdom Independence Party councilor Lawrence Webb speaks at Havering Town Hall in London on June 1. Webb is campaigning for the British to leave the European Union. (Left) Cameron Singhclare, a student at Aberystwyth University, says the city is welcoming and liberal in large part because of the university and its large number of foreign students. (Right) Toby Bragg, who works at a cycle shop in Aberystwyth, supports staying in the EU and likes a multicultural United Kingdom. 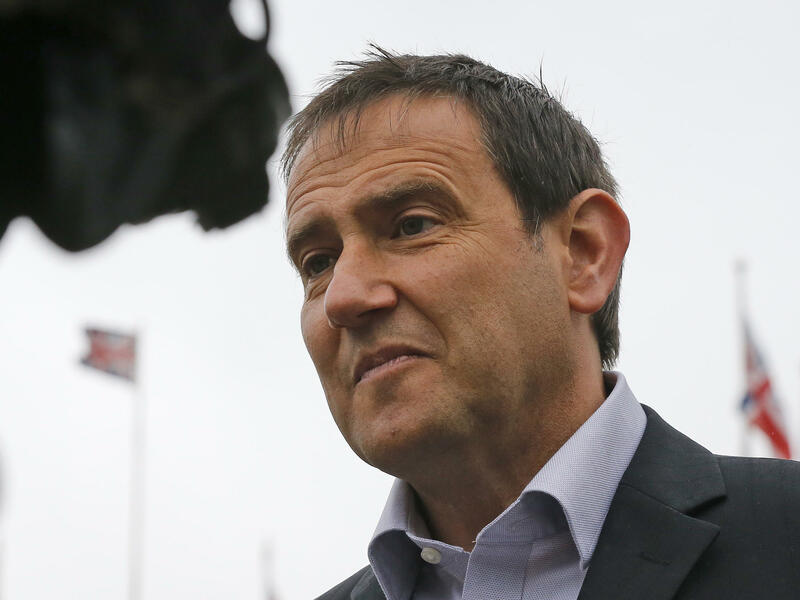 Tony Thompson hopes the United Kingdom votes on Thursday to leave the European Union. Standing in a green smock behind his meat counter in the town of Romford, a short train ride from central London, the 58-year-old butcher explains why in four words. "Got to stop immigration," says Thompson. "It's only an island. You can only get so many people on an island, can't you?" Thompson says immigration has cost him. He had a butcher shop in London's famed East End, but over time, his white, British-born clients moved out and were replaced by Muslims from Somalia, Pakistan and India. They had no use for an English butcher — they could eat only halal meat. "That's when I noticed a lot of change," says Thompson, "because my business went under." Thompson insists he is not a racist — he has four mixed-race sons — but he thinks communities and the culture are changing too fast. "It's like the English are being pushed out to the coasts," he says, "and main towns, even Birmingham and those places, it's not England anymore." Thursday's vote is officially about leaving a giant trading block of 28 nations with more than 500 million people, but most in the so-called "Leave" camp are — like Thompson — focused on immigration. They say membership in the EU permits too many foreigners to flow too freely into their country. Romford is part of the London borough of Havering, which YouGov, an online polling firm, estimates is the most anti-European area in the country. Although the vast majority of people in Havering are white, the percentage of minorities has more than doubled since 2001, according to government figures. Lawrence Webb, a councilman in the area, says rapid growth has frustrated locals. A journey that used to take ten minutes across the borough now takes 30. Big houses, Webb says, have been replaced by a series of apartments. "It has nothing to do with color and race necessarily," says Webb, who is with the nationalist UK Independence Party, which is campaigning hard for a British exit — or "Brexit" — from the EU. "People perceive that their quality of life is diminished." Drive five hours west of Romford through rolling hills dotted with sheep, and you arrive in Aberystwyth, which sits in a cove along the Welsh coast looking out toward Ireland. Aberyswyth looks like a classic British seaside town, with a fading pier stretching out into the ocean and the remains of a castle on a nearby hillside. YouGov's polling found that the area around the city was the most EU-friendly region in the United Kingdom. Even though Aberystwyth is far from London, it feels more diverse than Romford. Consider Shumana Palit, who works as a server at Ultracomida, a Spanish restaurant and deli. "I'm originally from Wales, so I'm half-Welsh, and my father's from India," Palit says as she prepares a coffee behind the counter. "My husband's half-Spanish, half-French." Palit says a major reason the city has an unusually cosmopolitan feel is because of Aberystwyth University, which has a large population of international students. "It feels very European when you're here," she says, "it doesn't feel like somewhere that wants to be cut off from Europe." Instead of seeing membership in the EU as a problem — as butcher Tony Thompson does — many businesses here see it as crucial to their success, because it allows them to trade freely with the continent. Ultracomida owner Paul Grimwood places 30 orders a week from Spain, which is comparatively easy because the EU operates as a single market. Grimwood says that a Brexit would make things harder, and that it would drive down the value of the British pound and raise his costs by 20 percent. In some parts of the country, people complain that working-class immigrants are driving down wages. But Cameron Singhclare, an economics student at the university, says foreigners in Aberystwyth are different, and less of a competitive threat. "The majority who came here are students or academics or professionals, and maybe that's why there is less resentment about migration from the EU," says Singhclare, who rooms with a Bulgarian. Toby Bragg, who works at Summit Cycles in town, has spent much of his career in the U.K. and Europe working with people of different nationalities. He says his fellow citizens who don't like the changing ethnic makeup of the country have short memories. "We're essentially an island," says Bragg. "If you look back through history, we've been colonized, overtaken, invaded, assimilated many, many different ways. "I get the idea that for some people there's this very English England — which probably never existed or ever will." Should they stay, or should they go? That is the question facing voters in the United Kingdom tomorrow. In or out of the European Union? Immigration and national identity have been big issues in the so-called Brexit campaign. Many who want to leave the EU complain it allows too many foreigners to flow too freely into the U.K. To understand this divide, NPR's Frank Langfitt visited two very different communities. We begin our coverage in the town of Rumford. FRANK LANGFITT, BYLINE: Tony Thompson wants out, and the burly 58-year-old butcher says there's one main reason. TONY THOMPSON: Got to stop immigration, yeah? Because it's only an island, you know? You can only get so many people on an island, can't you? LANGFITT: Thompson says immigration has cost him. He had a butcher shop in London's famed East End, but over time, his white, British-born clients moved out and were replaced by Muslims from Somalia, Pakistan and India. THOMPSON: And those people don't use English butchers, you know? They were halal. It's all halal. And that's when I noticed a lot of change because my business went under. LANGFITT: Because all the customers nearby wanted halal or something different? THOMPSON: They wanted halal that was different. It's a different people. LANGFITT: Thompson knows how this sounds. THOMPSON: I mean, I've got four mixed-race boys. So I am not racist. LANGFITT: Thompson now works farther to the east in Rumford, part of the London borough of Havering. But he says the ethnic makeup here is shifting, too. THOMPSON: It's like the English are being pushed out to the coast. And the main towns, I mean even Birmingham and all them places, it's not England anymore. It's got nothing to do with color and race, necessarily. You know, people here are fairly tolerant. LANGFITT: Lawrence Webb is with the U.K. Independence Party. He's a councilman in this area, which the online polling firm YouGov estimates is the most anti-European in the country. Although the vast majority of people here are white, the percentage of minorities has more than doubled since 2001. Webb says rapid growth has frustrated locals. LAWRENCE WEBB: People perceive that their quality of life has diminished, even to the point of fact that a journey that used to take you 10 minutes to get across the border now takes you 30 minutes. There are more people, more cars on the road, and we can see it, all the green spaces are disappearing. Where there once there was one big house there's now 10 flats. LANGFITT: If you drive five hours to the west of Rumford, you end up here in a town called Aberystwyth. It's on the Welsh Coast, and it has this kind of classic U.K. seaside look. There's a big pier here to my left. It's also interesting, there are flags from all over the world that are waving here along the seaside. And according to that poll, this is one of the most pro-European communities in all of the United Kingdom. Shumana Palit is making coffee at Ultracomida, a Spanish restaurant and deli in town. People like her are the evolving face of Great Britain. SHUMANA PALIT: I'm originally from Wales so I'm half-Welsh, but my father is from India. So I have a mix in my family. My husband is half-Spanish, half-French. LANGFITT: Although Aberystwyth is remote, it has a much more cosmopolitan feel than Rumford. Palit says a major reason is Aberystwyth University, which has students from all over. PALIT: So you've got a mixture of different nationalities in quite a small town, really. It feels very European when you're here. It doesn't feel like somewhere that wants to be cut off from Europe. LANGFITT: Instead of seeing membership in the EU as a problem, as butcher Tony Thompson does, many businesses here see this crucial to their success because it allows them to trade freely with the continent. I spoke with Ultracomida owner Paul Grimwood. What kind of impact would a Brexit have on your business? PAUL GRIMWOOD: Immediate and substantial. I believe I place maybe 30 orders with Spain a month. Already the pound has slid against the euro. If things start to unravel, well, I haven't done the maths, but I think it's a 20 percent rise in my costs. LANGFITT: In some parts of the country, people complain working-class immigrants drive down wages. But Cameron Singhclare - he's an economics student at the university - says foreigners here are different and less of a competitive threat. CAMERON SINGHCLARE: The majority of people who became (unintelligible) here are students or academics or professionals. And so maybe that's why there's less resentments about the migration from the EU. LANGFITT: Toby Bragg works here in town at Summit Cycles. He's spent much of his career in the U.K. and Europe working with people of different nationalities. He says Britons who don't like the changing ethnic makeup of the country have short memories. TOBY BRAGG: I mean, we're essentially an island so if you look back through history, we've been colonized, overtaken, (laughter), invaded, assimilated many, many different ways. And I get the idea that for some people, there's this sort of - this very sort of English England, which probably never existed or ever will. LANGFITT: Recent polls suggest voters are almost evenly divided over whether to leave or stay in the EU, much like the communities of Rumford and Aberystwyth. Frank Langfitt, NPR News, London. Transcript provided by NPR, Copyright NPR.